MSgt. Walter Edward Appleby, USMC (Ret. ), 88, of Summerville, SC, husband of Joyce Norma Ashbrook Appleby died Monday, March 18, 2019. The family will receive friends Wednesday, March 20, 2019 at J. Henry Stuhr, Inc., Northwoods Chapel, 2180 Greenridge Road from 4:00 pm until 6:00 pm. 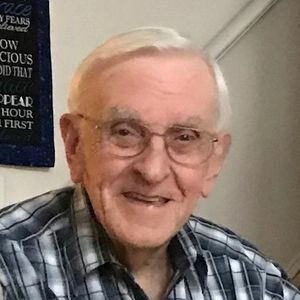 His Funeral Service will be held Thursday, March 21, 2019 at Stuhr's Northwoods Chapel at 10:00 am. Interment with military honors will follow at Jackson National Cemetery, Columbia, SC, at 1:00 pm. Walter was born August 6, 1930 in Providence, RI, son of the late Urban S. Appleby and the late Mildred Robbins Appleby. He was raised in Massachusetts and graduated from North Attleboro High School. He was a Master Sergeant in the United States Marine Corps, served during the Korean war and retired after 20 years of service. Walter worked for five years at Waccamaw Pottery and was an ordained Deacon and attended Lydia Baptist Church in Summerville, SC. He is survived by his wife of 65 years, Norma Appleby; two daughters, Linda A. Lee (Ronald) of Prosperity, SC and Joyce A. Stiehler and family of Norman, OK; granddaughters: Lori Beth Lee and Chrissy Lee of SC and Kimberly DiCesare (Jason) of FL; and three great-grandchildren: Madison, Karalyn and David DiCesare of FL. Memorials may be made to Whitten Center Parent's Club, C/O Marlene Woods, 304 Dixon Street, Clinton, SC 29325-4274. Dad I love you and miss you. You taught me so much about life and patience. Until we met again. Surely be missed by all his friends. Rest in sweet peace Mr. Walt. You have always been so kind to all of us. You will be missed. So many fond memories of this kind, gentle man who was a servant of the Lord. Norma, and all the family my heart goes out to you at this time. He will be sadly missed, but never forgotten! Will be praying that you will find comfort in the knowledge that though Absent from the body - present with the LORD. Would like to think Johnnie greatest Walt with a big hug! Norma, Linda, Joyce all of you are in my prayers that God will give y'all comfort and peace. Walt was a very good man and you are in my thoughts and heart. Life Stories provides friends and families a forum to post their favorite stories and memories of MSgt. Walter Edward Appleby ensuring the precious experiences are never forgotten. Share joyful times, post a photo that captures the moments you cherish, and allow others to reply, relive and remember.